'Figured we could use a thread for various tidbits that don't need a full thread. Brooke has withdrawn from the VIC Open due to illness. International travel is tough. Minjee's solid play has moved her to #3 in the World Ranking. Is #1 within reach? I'd say yes. I'd say yes, because she's playing well and the competition is so flat. Tiger once reached an average points in the world ranking of about 33. I'd be interested to know exactly what he peaked at. By comparison, right now, Ariya is at about 6.49, and not tearing it up. Anyone in the top 10 can grab No. 1 with a few wins. The thing that will hurt Ariya in the near future and could hurt Minjee if her result don't stay in the top 10 is the divisor in ranking calculation. The divisor= total events played in a 2 year period. Both Ariya and Minjee are at 56 and the sweet spot that allows you some margin is between 45-50 IMO. Ariya had a great season last year and Minjee had a very solid one but at 56 if either or both aren't racking up lots of top 10 and honestly top 5 depending on strength of field they will start to fall like a rock, I noticed this with Brooke when she was over 60 and Brooke is winning 2 events a year and racking up and average of over 10 Top 10 a year and she fell down to 16th I believe was her low. Ariya has earned 2.1, 1.26 and 6.2 her last 3 events below her current average of 6.49 and the formula for the ranking give a higher value to the more recent results, so without getting wins when you previous good performance lose weight you start to fall like a stone a the top end. The divisor has a minimum of 35, even if a player has played just one tournament in 2 years. The divisor is neutral when a player has played 35 or more tournaments in 2 years. The small divisor helps when a player plays well and scores more than her average score in tournaments; but it hurts when a player plays poorly. Additionally, a small divisor hurts when a player doesn't play; because every player loses between 1.5 to 2.3% of her total points every week. Inbee illustrates precisely what I stated earlier. Rolex site shows the number of tournaments Inbee played in 2 years, 34. But her score is based on her total point of 169.21 divided by 35; which equals 4.83. Muni He is the cutest girl out there !!!!!!!!!!!!! When Tiger got to 33 or so points he, like Inbee, was playing below the minimum divisor number of tournaments. So the freak average actually understated his dominance. These are both players who prepare for and enter into a tournament with the intent to win it. I wonder if this is a superior strategy to the Henderson/Lee/Jutanugarn(2) strategy. Paging Anna Nordqvist, will Anna Nordqvist please step back in to the winners circle. Anna Nordqvist to the winners circle. Thank You. As expected, Sung Hyun took over the World #1 ranking from Ariya with her win in Singapore. I'm assuming we'll see a lot of swapping at the top of the rankings. Jim Young jumped 3 spots, and back into the Top 10. Does anyone else feel this is a make or break year for several of the players on tour? Yani is on a career money list exemption. It could be back to q-school after this season. Paula Creamer and Morgan Pressel, once the darlings of the tour have not been playing well. Morgan seemed to resurge a few seasons ago but then went away. The moms on the tour understandandably have other priorities beside golf. You get the feeling Stacy could walk away tomorrow and she'd barely miss the tour. Her motivation seems to try and advance women in sports. A few future moms over the next year SJ Smith, Brittany Lincicome and maybe 1-2 more to add to those already on tour. Laura Davies and Juli Inkster, how much longer can they realistically play at a competitive level? Laura still says she can win on tour and nothing would make me happier but she'll need to start making cuts again. She's had a pretty awful start to the season. Other veterans like Karrie Webb and Catriona Matthew seem to be winding their career down. How much longer will Inbee Park play? She said injuries caused her to limit her schedule the last 2 seasons but danced all around questions about motivation and what she has left to prove. Michelle Wie, will getting married help or hurt her career. 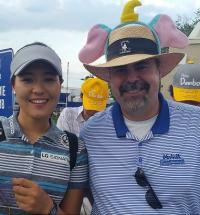 Lydia Ko, has she peaked already? Nothing against any of the above mentioned players but it just seems there are lots of young hungry players out there that are willing to be 100% dedicated to golf. There is no room for distractions to challenge players like Nelly Korda, Lexi Thompson, Nasa Hataoka, Ariya & Moriya Jutanugarn, Brooke Henderson, Sei Young Kim, Sung Hyun Park, So Yeon Ryu etc. Georgia Hall, Charley Hull and Celine Boutier could provide a new European front. I believe every year is pivotal for a handful of players. It seems the rookies keep getting better each year as a collective, so the players on the bubble have to work harder to simply keep their cards. I don't think Michelle is going to be affected by marriage. 'Plenty of players continue to perform after getting married. I think the injuries are going to be a much larger concern. It's crazy to think that a player could peak at 17 years old. Has Jordon Spieth peaked? Lydia obviously went into a minor tailspin, but seems to have pulled out of it. I think the reason she's not going to get the same level of results is that the competition is that much better. She needs to pick up yards off the tee, i.e. 255+, and focus on her putting. Inbee got it done with her putter despite being shorter than average off the tee. 'Not sure Georgia and Charley constitute a "front". Yeah, they won two majors last year, but other than that...crickets. Carlota is the only player that seems to be putting up consistent results. Jin Young jumped 5 spots in the World rankings to become #4. Nelly moved ahead of Lexi to become the top ranked American player. Creamer seems to have something going on in her personal life right now. Put out an announcement that she wasn't playing in the next two tournaments even though she loves both events. Lydia Ko - I'm not sure about the distance thing. Whenever her or Spieth win they hit it far enough and do other things great. When they don't win, they are severely handicapped. The other Ko just won this week hitting it about the same yardage as Lydia. I do agree the path to having years like 2014-2015 is much more challenging, with distance being one aspect of the competition (in 2014-2015, Lydia was basically on equal footing vs. Inbee and Stacy Lewis distance wise). But her game does seem better recently, and I'm interested to see if she can be in the conversation of the top 5 players. Sometimes I think Lydia seems too happy just doing what she's doing. I know she always said she wouldn't play golf forever, but it seems like having some decent cash in the bank, playing a game, and enjoying the travel/tour friends is good enough for her. Nothing wrong with this but it doesn't give the record books a run. Ingee Chun - I actually think this is a huge year for her. If she doesn't use the win / IL Crown as something to get her game back I'm afraid she might be lost. She had so many 2nds after winning the U.S. Open/Evian, the scar tissue may be there. Add that the Korean media is not exactly forgiving to these players, and I can see how it becomes mentally hard. Also, her distance off the tee is becoming an issue. Lexi - doesn't seem to be having any fun with golf. Numerous issues post the 2017 ANA (despite the win late last year). Wonder if she can be happy and find it again. Wie - wouldn't be surprised if we don't see much of her (or if she's not really a factor competition wise) going forward. Combo of marriage and injuries. Ryu - off to a slow start (hasn't played much) so far this year. Interested to see if she can hang around the top 5 and possibly grab another major. While very very good, I feel like she may have the least amount of raw talent among everyone listed here and has done well to get to #1 / the record she has. I have a sense that she's playing for the 2020 Olympics (should stay motivated for another 1.5 years) and how long after that will depend on whether (only) 1 leg of the career slam remains. Nelly, Ariya, Brooke, Minjee, SHP - expect them all to be good and get better (with Ariya/SHP having the highest bar). The future is uncertain (Lydia, Yani) but these all seem like players that could win multiple times a year for a couple/few years. I don't profess to be able to predict who will come out on top. I don't think Michelle is going to be affected by marriage. 'Plenty of players continue to perform after getting married. I am pretty confident that Lydia Ko is back in the mix already. She needs to get a little more consistent, and she has let me down just when I think 2015/2016 Lydia is going to emerge. But overall, she is swinging better and looks happy and confident with what she has. I still love those approaches from 60 or 70 m. She has the best touch in the game. In Gee is a mystery, not least is because we don't get to see her because she is so far back! This peaking at 17 thing seems very much a female thing. Same with retiring or semi-retiring in your prime (Ochoa and Inbee). I think old male champions go to the grave thinking they can win more time. It's been an exciting start to the season for me so far- some new talent, and some old stagers (like 22-23 yo). Winners are JYK and Nellie. Minjee has been brilliant, but it's still wait and see with her. Yet to fire a shot - In Gee, So Yeon and Ariya! Great to see Haru back! One doesn't have to be a long hitter to be successful, but being average certainly helps. The vast majority of World #1's in the past 15 years have had average length off the tee. During Lydia's time with Lead Poisoning, she gradually got shorter, and her accuracy also suffered. She went to him to increase length, and wound up going in the opposite direction. With so much focus on her full swing after the coaching switch, her short game suffered. At this point she does appear to have regained form. That's fair, I guess I sometimes forget that she didn't only get passed by in distance (from the new top players) but also went backwards. Clearly there are other parts of the game (putting) but distance is the one thing that allows a player to runaway a bit when everything else is clicking. I wonder if the women's game will mirror the men's game a bit more where the longer players are generally holding down the top spots going forward? In the top 15 right now, Jin Young Ko, Inbee, and Lydia are the only three with average to below average length. On any week these players can win, but it doesn't make life easier. It almost feels like the Minjee / So Yeon distance (I guess Nasa and Georgia Hall are around here too) is what's needed to not be at noticable disadvantage. I think a player can make up for lack of distance off the tee, but only up to a point. Jin Young is currently mid-pack at 261 yards, which is plenty long. On top of that she's ranked 5th in ballstriking (ahead of So Yeon), and 17th in total driving. Medium and short hitters can win, ala Jin Young and Eun-Hee Ji; but they're at the mercy of the long hitters. When Sung Hyun Park and Nelly Korda play to their best, there're little room for other players. Ariya's "A" Game will destroy any player on the LPGA she's up against, Period end of story! I 'll weigh in on some of these just based on my gut instinct.Had just started following lpga when Yani was peaking.After watching her effortlessly(seemingly)win a couple of tournaments I thought she would dominate the tour for the next 10 years.Not sure what happened to her and I don't even remember what the talking heads expert speculators surmised but I think her make or break year was at least 5 or 6 years ago and and on most days these days she couldn't even beat the"real"Yanni. Paula Creamer and Morgan Pressel had impeccable timing as if they had been 10 years younger I don't think either of them would have made it on the lpga. Most of the moms on tour will hang around(for the most part not competitive)as long as they can sorta as figureheads for as many of Whan's new politically correct initiatives that they will fit into.Although many complain about lpga purses they still are good enough where a mid-pack never win player can retire comfortably at 40 years old and live in a million dollar house almost any place they choose.So the triple motivation killers (no real need for money,age,and children to raise)are all in play for these mommies. I'll skip a few and comment on your last one about the Europeans.I think the pinnacle of Boutier's career was Thursday at Phoenix.She will hardly ever be seen or heard from near the lead again.Georgia Hall has a similar problem as Inbee and Lydia(short off the tee) only without the putting and short game prowess.Same prediction for Hall as for Boutier above.Now after Hull shows up at Phoenix all svelte and fit the jury will remain out on her. I think any of the top players' A games will handily beat the competition. Look at Sei Young at Thornberry Creek last year. She won by a whopping nine shots! The reality is that the A game rarely shows up, or only peaks its head out for short bursts. Players rise to #1 by stringing together solid stretches of play that generally fade. As good as Ariya has been, she didn't hold the #1 spot for long. The competition is that tough. I generally agree with this. I also think this is where the distance factor comes into play as well. To win, you need to play relatively well and not have one of the other top players doing the same. But when everything clicks relatively well, the bombers just have a few more easy birdies out there, and can runaway from the field by a few shots. It's not impossible for others to do so, but most of the people I'd pick (guess) to win multiple times this year all probably averaged ~260+ off the tee last year. When Lydia was winning a ton in 2014-2015, she was in about the 60th percentile off the tee. At the time, there were also few bombers that were actually good at the rest of the game (Lexi, Jessica Korda). In contrast to today, many of the very good players are also giving it a pretty good whack. There is no doubt that Jin Young Ko's swing/ballstriking is amazing. But last year she was only 77th in distance off the tee or just a few percentage points above average (53rd percentile). This year her absolute distance is up, but she's still only 71st or right around the average. She just won and is currently ranked #4 in the world, so there's no doubt she has the game to be at the top. But it will be interesting to see if she can maintain top #5 / get to #1 with this relative disadvantage. Her ranking isn't that different relative to Lydia in 2014-2015, so it may still fall within the "make up for it up to a point." In the men's game, for all of the knocks on Spieth and his lack of distance, he was never really short. It's just that he didn't bomb it like most of the recent players that have been #1 (in 2015-2018 he was in the 58th-72nd percentile). To me the "make up" is ballstriking and a hot putter. Of the #1's in the past 10 years , Ai, Jiyai, Inbee, Stacy, Lydia, and Shanshan were all average (distance) drivers at best. So Yeon was slightly better. The key was that average was good enough, as their accuracy off the tee still gave them good shots into the greens. All true but do you think the game is changing like the men's game? Post-Tiger coming on the scene, the average distance player hasn't been at #1 much. Clearly, this is different than what's worked on the LPGA tour. I don't have a super strong opinion but I am inclined to say yes if forced to pick. Since Lydia gave up the #1 ranking in mid-2017, the top spot has been held again by short hitters Feng and Inbee for a longer portion than I would have guessed. I think we're seeing a shift in the women's game towards distance players, but they also need accuracy. Playing out of the rough doesn't get it done. Of the top 10 in driving distance, only 4 had wins. 6 of the top 10 in total driving had wins. The shorter hitters can certainly win, though. Inbee, Eun Hee, Marina, Moriya, Lydia, Annie, Thidapa, and In Gee all had wins last season, and all averaged less than 253 off the tee. Four of them averaged less than 250. I've sliced the data a billion ways, and no one thing stands out. The only conclusion I've reached is that each week the best ballstriker with the hottest putter generally comes out on top. Hitting greens gives one more legitimate birdies opportunities, and the greens hit usually come from being in the fairway. This past week was a classic example. Jin Young hit 83% of her greens while averaging 88% of her fairways with an average drive of 261 yards. With 15 greens per round, she only needed 28 putts. Nelly averaged nearly 20 yards longer off the tee, but had 29 putts per round. She also hit 83% of the greens, and 91% of the fairways, but that extra putt per round was the difference. Any idea what has been the difference in the two tours? The men can hack it out of the rough and still get in on the green (even a 500 yard Par 4 is a 300 yard drive somewhere and a 6-iron with a half decent lie; i.e. enough loft if you have lots of speed) whereas the ladies can't? I've also pondered the difference in driving accuracy on the two tours. In one sense, 5% offline is more yards offline at 300 yards than 250 yards. However, even pre-Tiger I don't think the men's driving accuracy was anywhere near what the LPGA players are at. No doubt that on any week anybody can win. Inbee was #1 for a bit last year and some of the others listed had pretty good years, but they generally seemed like a bit outside of the top tier of players last year.